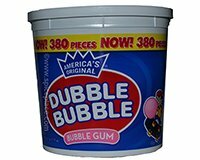 America's Original Flavored Bubble Gum - Dubble Bubble® Individually Wrapped Gum Bubble Gum flavor. Directions for use: Remove wrapper from gum, place in mouth, chew until soft, and blow bubbles. Enjoy. Ingredients: Sugar, Corn Syrup (Glucose), Gum Base, High Fructose Corn Syrup, Artificial Flavors, Artificial Colors (Fd&c Red 3), Corn Starch, Bht (To Maintain Freshness). Allergy Information: Milk and Soy may be present. Dubble Bubble is a Registered Trademark of and is manufactured by: Concord Confections, Division of Tootsie Roll Industries, LLC, Chicago, IL 60629, Product of Canada.